Is everyday stress making you crazy? We hear you! It's a common issue with today's modern society; however with Primal Calm you get back to basic. Stress depends on our lifestyles, but it is also influenced through our nutrition. 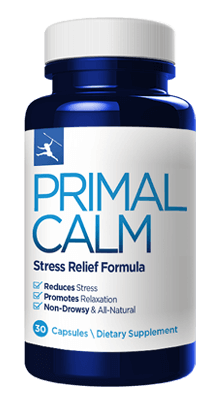 Primal Calm (formerly Proloftin) contains the nutrients that have been proven to reduce the effects of stress. This supplement is all-natural and requires only 2 easy-to-take capsules per day to obtain stress-reducing nutritional support. L-theanine, Magnolia Bark, and other ingredients make up this patented blend of effective stress fighters! Phosphatidyl Serine has been called the “Anti-Stress Superstar”. L-Theanine has been shown to reduce psychological and physiological stress responses. Helps relax you to enjoy life again with all-natural ingredients. Primal Blueprint operates in Malibu, CA, and the website was established in 2009 (12 years ago). This item has Rhodiola rosea which has been known to cause dreams that are intensely vivid and rich with details. This will pass with continued use in about 2 to 3 weeks. Some users prefer to take only one capsule to avoid being overly sleepy. With this all-natural formula, you will be amazed how much less stressed and anxious you will feel leading you to better manage everyday life. Primal Calm is not available at local retailers and must be ordered online.